Hazardous substances should be locked away in a secure facility when not in use. 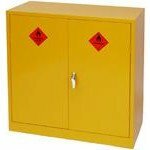 Moresecure provides a substantial range of storage cabinets to meet the regulatory requirements surrounding use of these materials. Typical use of these cabinets is to contribute to compliance with the Dangerous Substances and Explosive Atmospheres Regulations 2002 (DSEAR) which require employers to control the risks from fire and explosions. In the event of spillage within the cupboard, it is recommended the sump is initially emptied by means of an appropriate pump and the contents disposed of correctly in accordance with the relevant waste management regulations. Once the bulk of the spillage is pumped out, the sump can then be removed by hand and the residue disposed of as above. Seam welded sump with handles for easy removal. Complete with 3 perforated shelves fitted to allow drainage into the sump. Complete with 1 perforated shelf fitted to allow drainage into the sump. BioCote is a patented anti-bacterial finish used as standard on all internal and external surfaces of lockers and cupboards. BioCote inhibits the growth of potentially dangerous bacteria and fungi such as Salmonella, MRSA and E. Coli.